I'm a mother of 2 boys - remarried and stepmom to 2 more boys and 2 girls. (Yep that makes 6 kids) but...all are grown and have children of their own making me a grammy of 13. 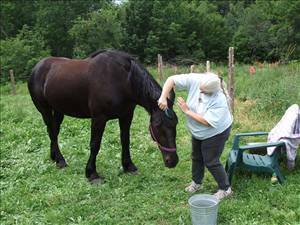 I work full time and have a part time job as well as helping my husband tending to our Percheron Draft horse (Mysti) who stands 16-17 hands and just LOVES attention. Our 4 ducks and our Bantum and Americuna chickens, and lest I forget our three Cats. I help around the farm when I have time and do things I can physically do. I have 1 repaired knee (new ACL) and one knee that needs total replacement (that is what I get for playing volleyball just a bit too hard and being overweight my entire life)(except for my Army Days). I am prior Army and in there they stated I would be in a wheelchair at age 40 due to knees deteriorating - NOPE ---didn't happen! But yep, blew both of them at different times. I was told - no long walks, no excessive knee usage and my one knee will last 10 more years - so that makes my walking up and down the dirt road and mountain we live on off limits. SO I decided to check out Richard Simmons Dancing to the Oldies - I must say - this will prove to be a challenge but like he keeps saying - "do what you can"! Sitting behind the desk working all day isn't doing me any good! I'm not lazy but I am not 100% motivated yet either - but I'm getting there. Why I hate (insert diet here). Definitely 'food' for thought! Great post! So what you are saying is rice is a good thing - we love our Basmati rice and eat it 3x a week. I like it with just a little pepper on it or plain along with the evening meal. It isn't a brown rice - does that matter?